All transactions are safe and secure with a reliable history in online purchasing behind each of our associates. 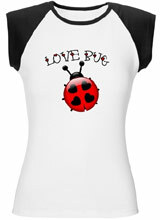 Buy the Jonas Lovebug t-shirt to own Jonas Brothers clothing and merchandise. Catch the Lovebug in this Jonas Brothers tee that features the Lovebug song title across the chest. A ladybug sits below the word "Lovebug". The Jonas Brothers Lovebug video shows a granddaughter looking at one of her grandparents' old photo albums, which chronicles the pair starting a life together. We see them on a boat coming to America, moving into a new home and saying goodbye to each other when the grandfather leaves for the war. Wear this piece of Jonas Brothers clothing under a warm Jonas hoodie or jacket for the perfect music merchandise ensemble. In addition to the Jonas Lovebug tee above, browse the Jonas Brothers Clothing Gallery for more apparel like men's and women's clothes, kids shirts or hoodies.